Third revised edition, loaded November 7, 2013. The son of Vyâsa said: 'Even though Krishna was the Supreme Lord, He, resorting to His inner potency [see yoga-mâyâ], decided to enjoy those nights in autumn when He saw the jasmine flowers blossoming. The king of the stars [the moon] at the time painted with his action the face of the east red, thus giving comfort to all who longed for him, just like a lover approaching his beloved ends her grief when he after a long time shows up again. Krishna saw how the kumuda lotuses opened to the full disc of the moon that glowed as red as the fresh kunkuma on the face of the goddess of fortune. He saw how the forest was reddened by the gentle rays of that light and sweetly played His flute that enchanted the minds of the [gopîs with their] beautiful eyes. 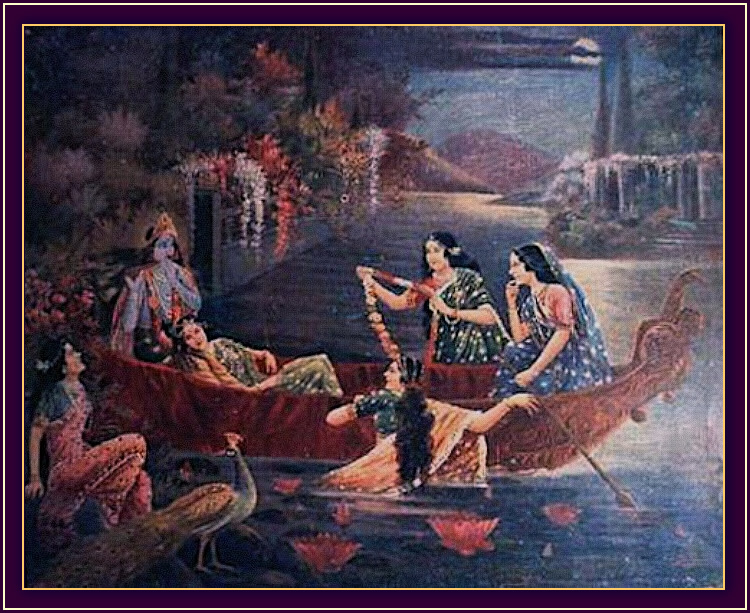 That song being heard by the women of Vraja awakened Cupid in their hearts so that each of them, unknown to the others, with her mind seized by Krishna and with earrings swinging in the haste, went to the place where He, her boyfriend, was situated. Some left behind the cows while they were milking them, some abandoned in their eagerness the milk they had on the stove, while others went away without taking the cake out of the oven. Some put aside the children they were feeding milk and dressed up without thinking of the service they would render to their husbands. Some left during their meals, some while they were oiling themselves, were smearing their bodies or were making up their eyes. 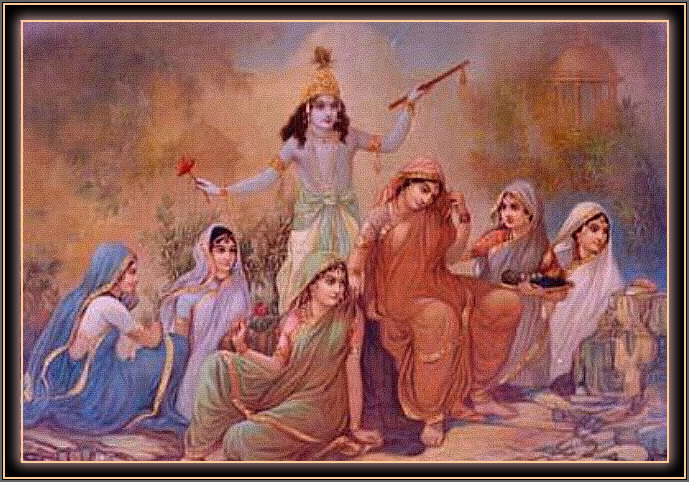 Others went to Krishna with their clothes and ornaments in disarray. They were checked by their husbands, fathers, brothers and other relatives but, enchanted by Govinda they, with their hearts stolen, did not turn around [to their duties]. Some gopîs who did not manage to get away, stayed at home and closed their eyes to meditate on being [transcendentally] connected in love with Him [see footnote* and 10.1: 62-63]. S'rî S'uka said: 'I spoke to you about this before [in 3.2: 19 and in 7.1: 16-33]. When the king of Cedi [S'is'upâla] could attain perfection even by hating the Lord of the Senses, what then would that mean for those who are dear to the Lord in the Beyond? The personal appearance of the Supreme, Imperishable and Inscrutable Lord who, free from the modes, is the controller of the modes, is there to lead humanity to the perfection of life, oh King. They who towards Him are constantly of lust, anger, fear, affection, unity or friendship will surely achieve absorption in Him. You should not be surprised about this [fact] concerning the Unborn Supreme Personality, the master of all masters of yoga, Krishna, by whose grace this world finds liberation. When the Supreme Lord saw the girls of Vraja coming to Him, He, the best of all speakers, did not use any charming words that would confuse them. The Supreme Lord said: 'All of you, be welcome , oh fortunate ladies. What can I do to please you? Please tell Me whether Vraja is all right and for what reason you came here. This night is full of fearsome looking creatures, so please return to Vraja oh slender girls. You women should not hang around here. Your mothers, fathers, sons, brothers and husbands undoubtedly are looking for you and unable to find you. Do not make your families afraid. You have seen Râkâ [the goddess of the full moon day] resplendent with her moonlight. You have seen the forest full of flowers that is even more pleasurable by the breeze that coming from the Yamunâ plays through the leaves of the trees. Go therefore, without delay, back to the cowherd village. You must serve your husbands, oh chaste ladies, the calves and the children are crying for you to give them milk. Or else, if you have come with your hearts overtaken by your love for Me, that is indeed laudable of you since all living beings have affection for Me. For women it indeed is the highest dharma to be diligently of service to her husband, to be simple and honest towards the relatives and to take good care of her family. For a well-educated woman to go astray dishonorably in adultery, is in all cases a contemptible weakness that creates fear and harms the reputation. S'rî S'uka said: 'The gopîs thus hearing the not so pleasant words of Govinda, being dejected because they were disappointed in their strong desires, felt an anxiety that was hard to overcome. Saddened letting their faces hang down and their bimba-red lips dry up, they sighed while scratching the ground with their feet. With their tears spoiling their make-up and washing away the kunkum on their breasts, they silently carried the burden of their great distress. Their Beloved One, not so loving at all, had addressed them contrarily, while they for His sake had desisted from all their material desires. They wiped their tears and stopped their crying and then, with their voices choked up in the attachment, in agony said something back to Him. The beautiful gopîs said: 'You, oh Mighty One, oh Goodness should not speak so harshly. Please reciprocate with our devotion at Your feet for which we have denounced everything else, do not play so hard-to-get rejecting us. Be just like the Godhead, the Original Personality who reciprocates with those who desire liberation. Oh dearest one, You as the Knower of the Dharma thus spoke of the duty of women that would consist of her faithfulness to her husband, children and relatives. So be it, but is it not so that You, oh Lord, You the Godhead, the most appreciated one who as the Soul for all embodied beings is the closest relative, are the real object of this instruction? The experts are constantly of service to You, who always endear them as their very own Self. So, what do our husbands, children and relatives mean to us who give us trouble? Have mercy with us oh Supreme Controller, do not cut down the by us for so long entertained hopes for You oh Lotus-eyed One! You easily stole our minds that were absorbed in our households, as also our hands that were engaged in household duties. Our feet will not move one step away from Your feet. How can we go back to Vraja, what should we do instead? Please oh Dearest One, pour the flood of the nectar of Your smiling glances and melodious songs that [by the flute] escape from Your lips, over the fire in our hearts. Otherwise we will place our bodies in the fire that burns of separation and by meditation on Your feet attain Your abode oh Friend. Oh You with Your lotus eyes, for the goddess of fortune it is a festival whenever she resides at the base of Your feet, the feet that now are held dear by [us] the people dwelling in the forest. Touching them we, being filled by Your joy, from that moment on will never be able to stand in the direct presence of any other man! The goddess of fortune, who together with Tulasî-devî has achieved a position on Your chest, is served by servants and the other gods try to acquire her look of approval. But the same way as even she desires the dust of Your lotus feet, we also have sought the shelter of the dust of Your feet. Therefore be of mercy with us, oh Vanquisher of all Distress. Renouncing our homes we have approached Your feet in the hope to worship You. Please allow us to serve You oh gem of all people, oh You with Your beautiful smiles and glances for which our hearts have burned with an intense desire. Seeing Your face encircled by Your hair, the beauty of Your earrings at Your cheeks, the nectar of Your smiling lips, the glances that make one fearless, Your two mighty arms and with seeing Your chest, the only source of pleasure for the goddess, we are delivered as Your servants. Which woman within the three worlds, oh dearest, would, completely being bewildered by the melody lines of the songs You draw from Your flute, not deviate in her civil conduct after seeing this grace of the three worlds, this beautiful form because of which [even] the cows, the birds, the trees and the deer experience a shiver of joy? S'rî S'uka said: 'Having heard the gopîs' despondent words, the Lord of all the Lords of Yoga full of mercy smiled, He who had been satisfied despite His ever being satisfied within. Being together with all of them He was as splendid as the - like the spotted deer - blemished moon surrounded by the stars. He as the Infallible Lord who is so magnanimous in His glances and proofs of affection, made their faces blossom with His broad smiles that beamed His jasmine-like teeth. Being sung and singing Himself as the commander of hundreds of women, He wore the five-colored [Vaijayantî] garland with which He increased the beauty of the forest where He moved about. Together with the gopîs He arrived at the riverbank that, served by the waves, was cool with its [wet] sand and was pleasant with the fragrance of the lotuses that was carried by the wind. Together with the Vraja beauties awakening Cupid, He took pleasure in throwing His arms around them in embraces. That way touching their hair, belts, thighs and breasts with His hands, He, challenging striking them with His fingernails, glanced at them and played and laughed with them. This way receiving from Krishna, the Supreme Personality of Godhead, the special attention of the Greater Soul, they, getting proud, considered themselves the best of all women on earth. 'It is understood that some of the gopîs are personified Vedic literatures (s'ruti-cârî), while others are reborn sages (rishi-cârî), daughters of cowherds (gopa-kanyâs), or demigod maidens (deva-kanyâs). But by no means, my dear King, are any of them ordinary humans.' There is also mention of sâdhana-siddhas and nitya-siddhas: those perfect of spiritual discipline and those born that way. The first painting on this page is of Raja Ravi Varma. Production: Filognostic Association of The Order of Time.